Nicely Gift Wrapped 100 Gms. 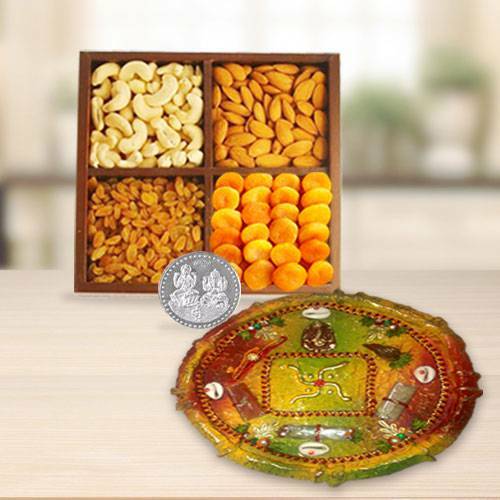 Dry Fruits (Cashew and Raisins) in a Designer Puja Thali with Free Silver Plated Lakshmi Ganesh Coin. Note: Gross Weight applies for Dry Fruits. Thali Size: 5"-7" inch. Nicely Gift Wrapped 250 Gms. Dry Fruits (Cashew and Raisins) in a Designer Puja Thali with Free Silver Plated Lakshmi Ganesh Coin. Note: Gross Weight applies for Dry Fruits. Thali Size: 5"-7" inch. Nicely Gift Wrapped 500 Gms. Dry Fruits (Cashew, Raisins, Almonds and Apricots) in a Designer Puja Thali with Free Silver Plated Lakshmi Ganesh Coin. Note: Gross Weight applies for Dry Fruits. Thali Size: 5"-7" inch. Nicely Gift Wrapped 1 Kg. Dry Fruits (Cashew, Raisins, Almonds and Apricots) in a Designer Puja Thali with Free Silver Plated Lakshmi Ganesh Coin. Note: Gross Weight applies for Dry Fruits. Thali Size: 5"-7" inch.